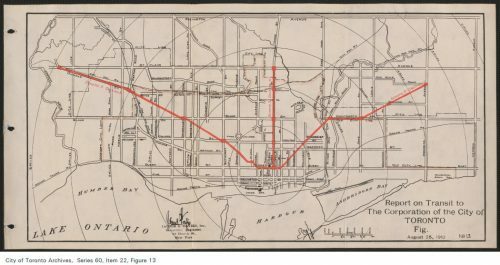 The recent controversies in Toronto about whether to build new subway or light rail lines, and in which locations, were foreshadowed by political debates going back more than a century. With widespread discontent about the privately-owned Toronto Railway Company’s operation of the streetcar system, Controller Horatio Hocken ran for mayor in the 1910 election on a platform of building “tubes” for Toronto. 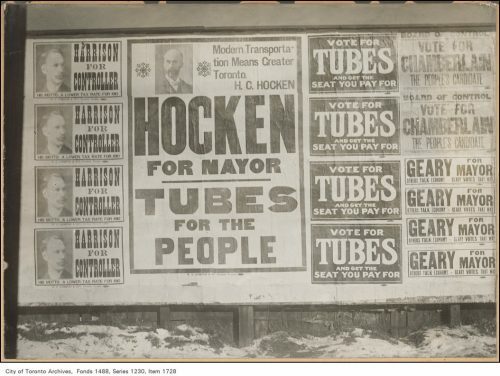 Although Hocken lost, a question on the ballot seeking provincial approval for Toronto subway construction was carried. The City hired the New York firm of Jacobs and Davies to come up with a plan. 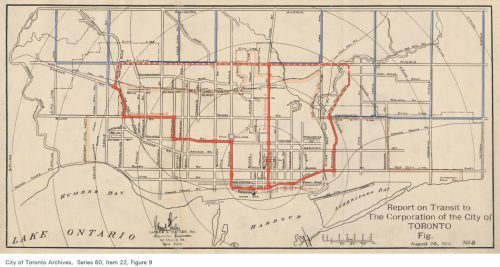 Of the three options, their preference was a central Yonge Street line and an east-west line along St. Clair Avenue. In 1911 the City sought bids for the construction of a north-south line extending to St. Clair. In the 1912 elections however, Toronto voters rejected the $5.4 million expenditure needed to construct it. 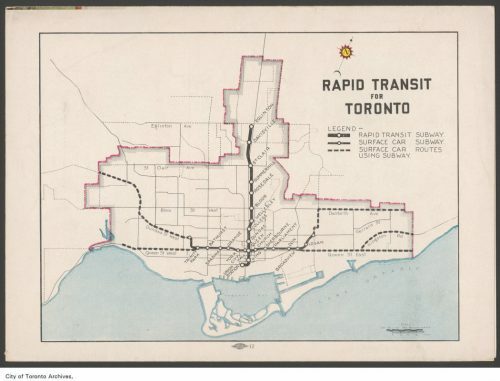 In 1944, the Toronto Transit Commission established a rapid transit department. 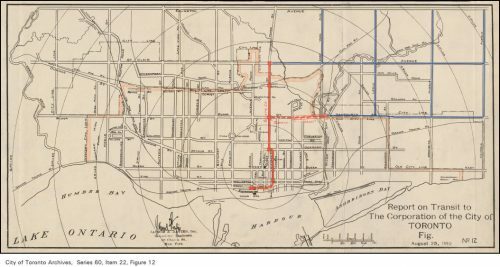 It determined that the city’s busiest north-south and east-west streetcar lines, which were along Yonge and Queen streets, should be converted to subway service. At first, both were planned as streetcar subways. That is, the streetcars would run in a dedicated right of way, and at some points underground. Later, the Yonge line evolved into a heavy-rail subway. Voters approved the plan by a ten-to-one margin in 1946. Just over eight years later, the Yonge line was up and running. Usage patterns saw the Bloor-Danforth route replace Queen Street as the preferred location for east-west travel. Even so, construction of the Queen line remained approved policy until 1980.